It was important to have the colours contrasty and clean, as this is a sunset without the usual dry summer feel. Its a typical sunset in Ireland – we get our fair share of wet weather, even in summer. The advantage is greenness, and clean air. I was trying to convey this here. 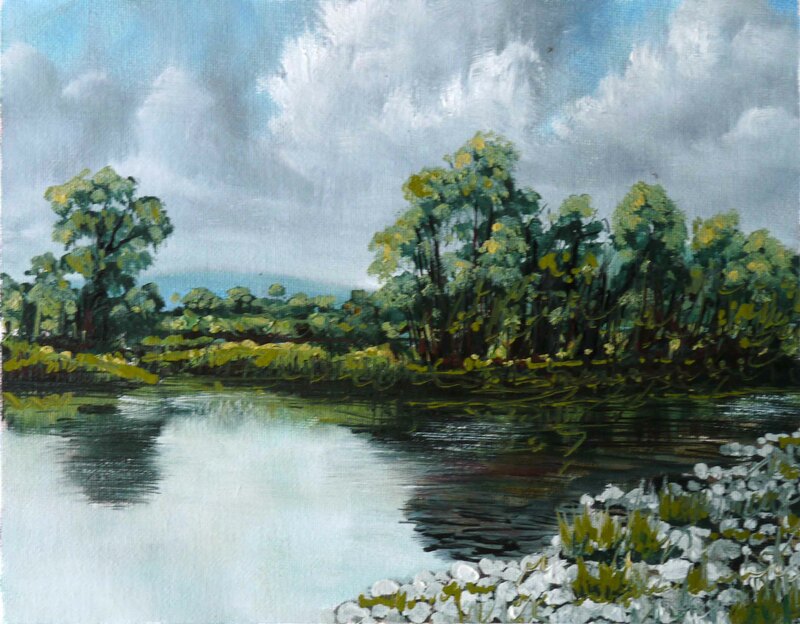 In the previous painting the trees were blended a little into the sky colour. 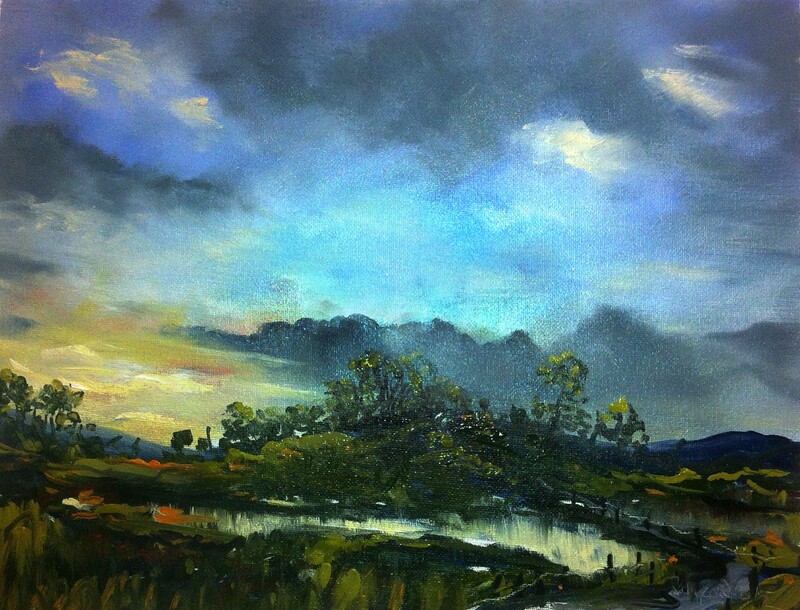 Here, I wanted no mixing of the ‘trees colour’ with the background ‘sky colour’. The painting of the sky involves a lot of vigorous brushwork. It would not be possible to create this sky while leaving clear canvas spaces for trees or anything else to be painted cleanly into. Look at the video and you will understand what I mean. When the sky is painted to completion, the only way to have a clean canvas to paint on, is to wipe off the sky paint where the trees will be. I do this with a tissue dampened with White Spirits. By leaving a light stain of the sky colour in the wiped off area, allows trees with sky light coming through. The colours, materials etc. are listed in the previous post. Here is the video. See you soon. The scene is near where I live. The bridge spans the canal, south of the town of Athy. I don’t know why this bridge is named ‘Bunbury’s’. 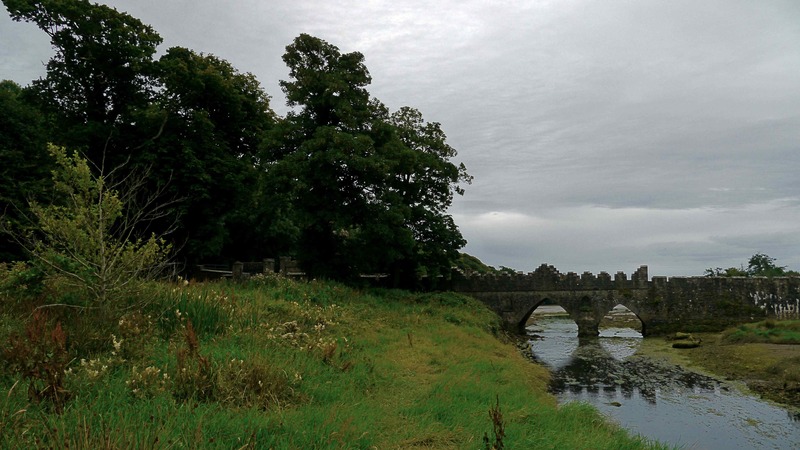 The bridge is disused now as it was on the entrance to Kilmoroney House which is now a ruin. Kilmoroney House was built before the canal arrived here in 1791, so the bridge was probably built at the expense of the canal company as it crossed the entrance to the house. Its possible Bunbury was the contractor who built the bridge. This week we had 24 hours of rainfall, non stop. One average month’s rainfall, in one day. Now the sun is shining again, and after the recent rain the air is clear and its extremely hot. This affects the colours in a sunset. The last post also featured a sunset with the colours we are more familiar with – reds, oranges and yellows. This sunset is after the rain and the colours are very muted. This is reflected in the palette of colours used. There are still only 5 colours used and they are the same as the last painting [Cadmium Red (red), Cadmium Yellow (yellow), French Ultramarine (blue). Viridian Green, Raw Umber] EXCEPT Cadmium Red is replaced with Burnt Sienna. The composition would appear to break one of the basic rules, which is ‘never put the centre of interest in the centre of the painting’. The bridge is dead centre and other elements are ‘see-sawed’ either side of this pivot. Its hard to plan this type of structure before starting to paint the picture. It has to be constructed almost like putting children on a see-saw. Two five year olds on one side will weigh the same as one ten year old on the other, or so you think. When the ten year old is outweighed, you add another three year old beside him, but now these two outweigh the other two, and so on, if you follow my drift. So it is with this type of composition. The large tree was supposed to balance the tow-path and smaller trees on the left. It was too heavy, so I put a gap in the line of trees to add more interest and give extra ‘weight’ on this side. It did, but too much. So more detail on the near right was added… and so on… and so on. Its more time consuming as constant reworking of already painted areas can go astray if concentration is lost. The total time of painting was about three hours. A lot of time was spent just looking at the painting, the actual time of painting was under an hour and a half. I can tell this from the video recording, which I will have in the next post. See you then. 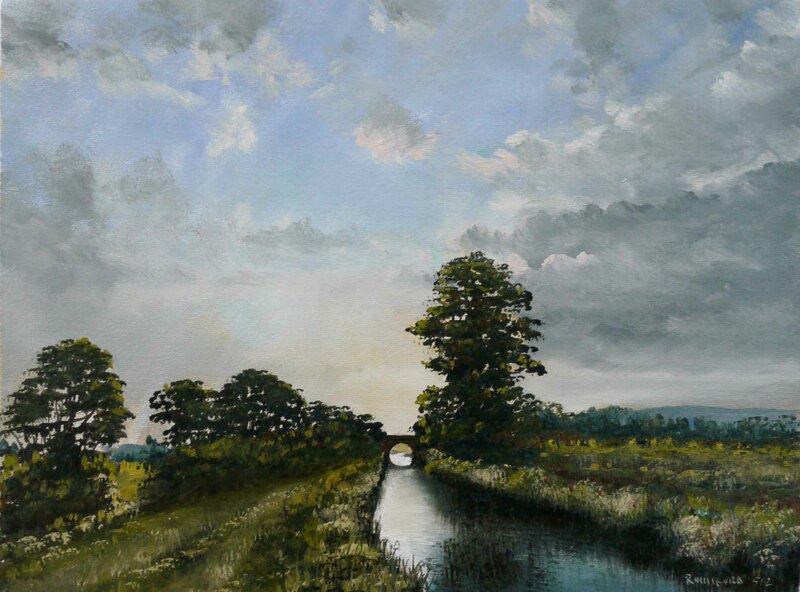 The sky in this painting is glowing with an intensity which can only be achieved using oils. Its an effect which takes a bit of work to achieve. Experienced oil painters are aware of how easy it is to loose the intensity of colour when mixing too many different pigments. I use the term ‘pigment’ here because you have to think in terms of ‘coloured materials’ (pigments) as opposed to ‘colours’. I’m familiar with using computer applications like Photoshop to produce colours by mixing different colour, usually layering colours one on top of the other. Intensity is not lost in this process. In physical painting, the process of glazing produces the same result. This is where the under colour is completely dry and there is no physical mixing of the pigments. Its this physical mixing of different pigments, as in alla prima, which can cause a loss of intensity. With this in mind, I limit the numbers of different pigments in a painting, so no matter what happens there will never be too many different materials to interfere with each other. 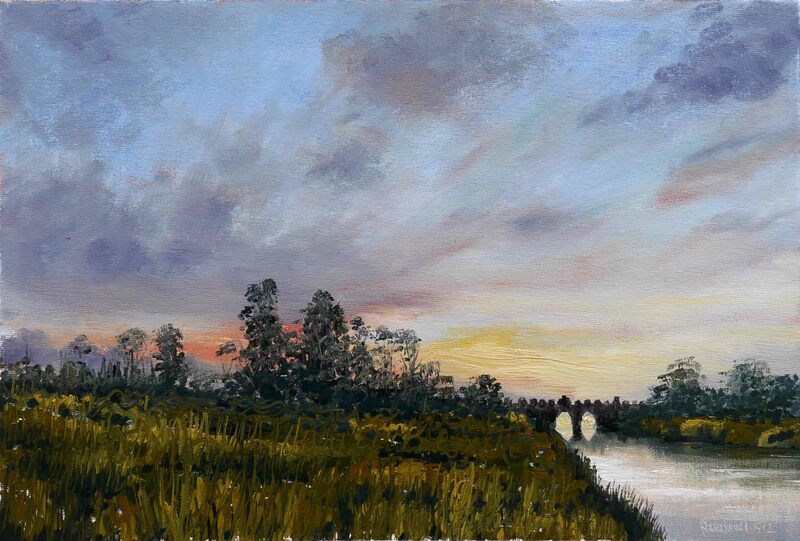 In the setting sun of this painting there are only 2 pigments used, Cadmium Yellow and Cadmium Red. Probably because these 2 paints come from the same source – Cadmium salts – they mix well producing an intense orange. The blue, Ultramarine, is mostly pure blue and white. The only other colour in this blue is Viridian Green which was a stain in the under painting. This helped the blue to merge into the yellow as it approached the horizon. The clouds, painted onto the blue, were a mix of the orange and blue, a colour which was already present. The clouds were now a mix of 3 pigments and intensity was slipping, a little Ivory Black corrected this loss. It might sound complicated, but this symphony of colour was controlled by placing paint down in blobs and manipulating the mixing by dragging the paint with a flat brush. Sometimes brushing hard to pick up the under colour and other times gently dragging one layer on top of the other to cover and not mix. The most difficult part is knowing when to stop brushing. Hopefully the video will help explain this process better than these words ever could. I think seeing the process is the only way to explain this. There is more background information on the previous post. Isn’t the technology to allow this to be explained visually wonderful? Here is the video. The soundtrack is a modern classical piece by Samuel Barber (1910-1981). I hope you like it, I think it is particularly beautiful. In 1200 ad, William Marshal, Earl of Pembroke, set sail for Ireland on his first visit as Lord of Leinster. Threatened with shipwreck, he vowed to found an abbey wherever he could safely land. 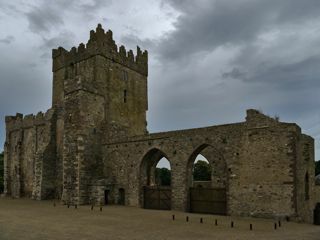 On reaching safety in Bannow Bay, he redeemed his vow bequeathing about 9000 acres of land for a Cistercian abbey. Consequently, Tintern Abbey, overlooking Tintern stream, is sometimes called Tintern de Voto – ‘Tintern of the vow.’ Once established, the abbey was colonised by monks from the Cistercian abbey at Tintern in Monmouthshire, Wales, of which Marshal was also patron. Not to be confused with Tintern Abbey, of Wordsworth fame, also a Cistercian Abbey, this abbey is now in ruins since the dissolution of the monasteries by Henry VIII in 1536 ad. There is ongoing restoration work in progress and it is a lovely place to visit. I was there last year and I took this photo of this curious little bridge over the Tintern River. Recently I’ve been watching sunsets from my back garden. This painting is an amalgamation of two images. The scene at Tintern needed drama and a sense of timelessness which a photo can’t achieve. The sunset colours needed to be applied to the scene. A photo of this scene at sunset would have produced a silhouette of the landscape, or if the exposure was based on a ground reading the sky would have been ‘burnt out’. The colours are different from my usual. They are: Cadmium Red (red), Cadmium Yellow (yellow) and French Ultramarine (blue). Viridian Green and Raw Umber were in there also. As you will see in the video (next post) the sky has quite a lot of green. The ground has a lot of the red and yellow. This crossover helps to tie the sky and ground together to produce a natural looking landscape. As I said I’ll have a video of the painting process for the next post. The painting took under 2 hours to complete. See you then.